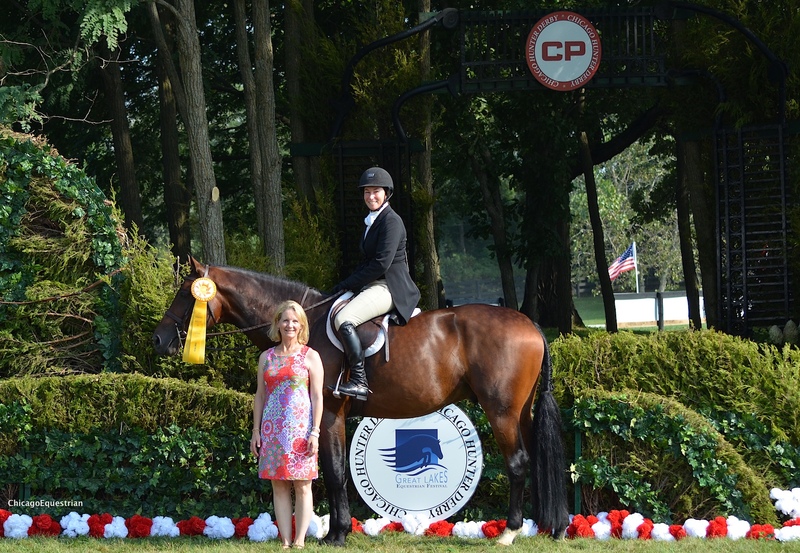 Tammy Provost and Essential win the $5,000 USHJA National Hunter Derby during the Chicago Hunter Derby presented by CP. 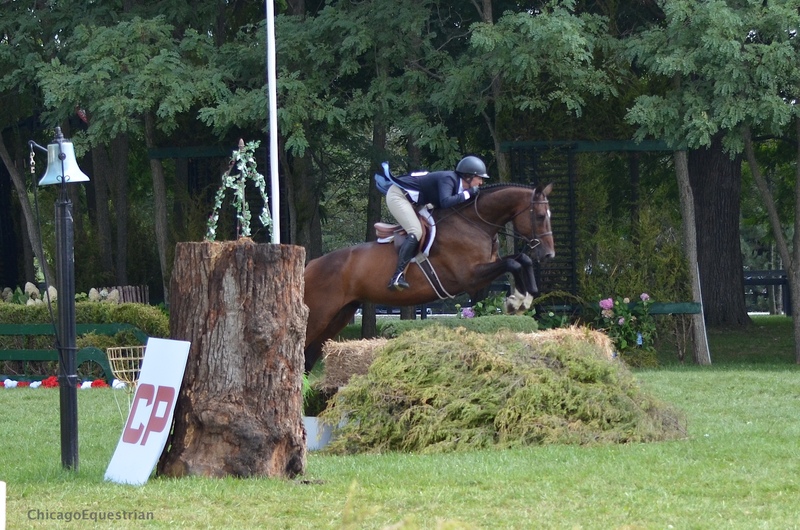 Antioch, IL – September 5, 2015 – The Chicago Hunter Derby presented by Canadian Pacific, kicked off with the $5,000 USHJA National Hunter Derby followed by the first round of the $50,000 USHJA International Hunter Derby. Riders took to the beautiful Bobby Murphy designed course in the field at Rush and Caroline Weeden’s Annali-Brookwood Farm in Antioch, IL. Tammy Provost and Essential lead the pack in both rounds. Receiving 90 and an 86, plus three high options for a 182, to take the lead in round one. Provost is always game to go for the win, as she galloped her way to another 90 and an 86, with four high options in the handy round for a total of 366 for the win. Provost, Wendy Hofmeister of Aurora, IL and Dean Berger own the handsome bay Hanoverian, Essential. 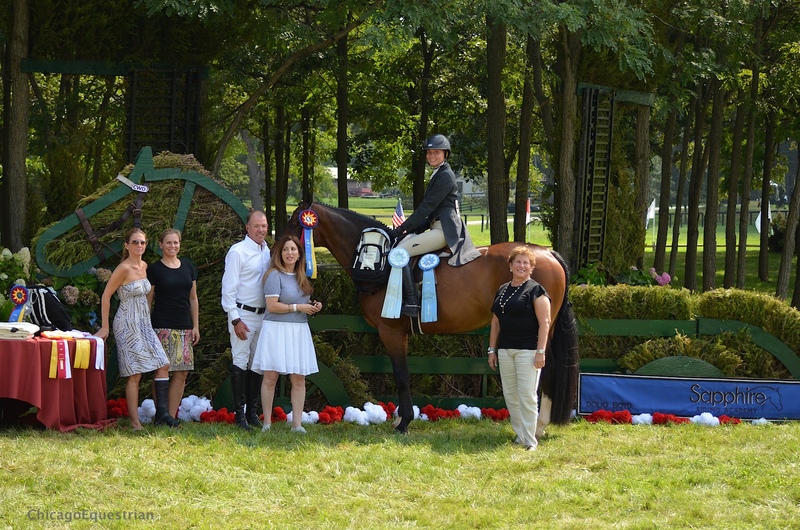 Essential won the USHJA National Hunter Derby and the $2,500 National Welcome Stake at Annali-Brookwood Farm's Chicago Hunter Derby presented by CP. Provost, Sheridan, IN, was a big contributor to the Score 90 Challenge with her sets of scores. In the Score 90 Challenge, pledges are made for every score of 90 or higher a horse and rider receive from the judges. Money is racked up for charity each time a score of 90 is earned. Provost did just that in both rounds with Essential and on another mount, Profit, Provost earned a 90 in round one, which helped them finish in third place. Maria Rasmussen and Aspen and Russell Frey and Kodachrome, also helped the charities out with their scores of 90 or higher. 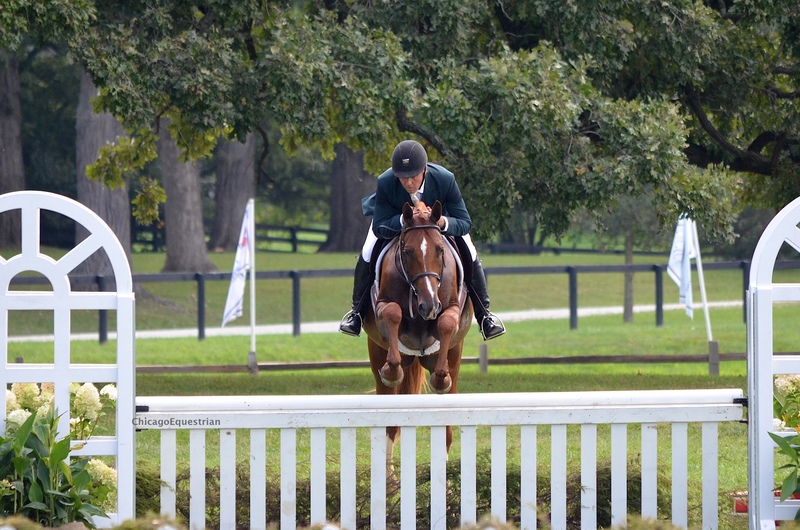 Russell Frey and Kodachrome finished in second place in the USHJA National Hunter Derby. Frey and Kodachrome, owned by Nina Moore, gave Provost a run for her money, but finished a half a point shy of the win. Frey earned a 91 and a 90, with four high options in the handy round, closing up the gap from round one, but not enough to steal the blue, finishing with a 365.5. 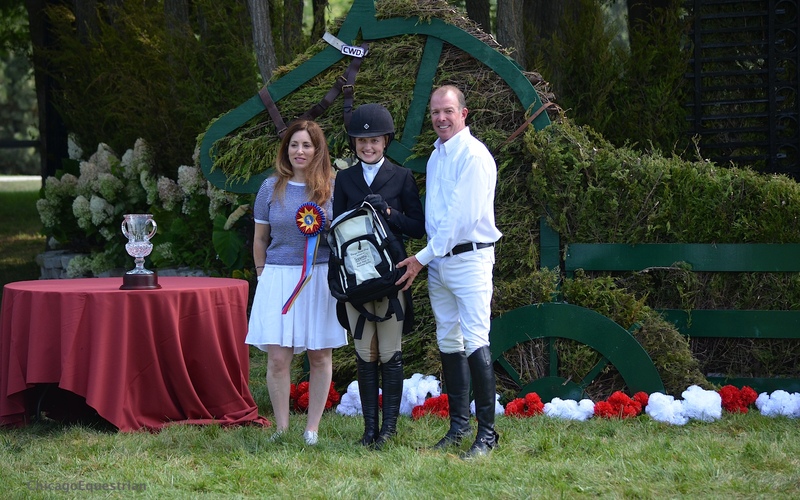 Ashley Vogel receives the Leading Junior Rider Award from Mimi Rothman and Doug Boyd of Sapphire Riding Academy. 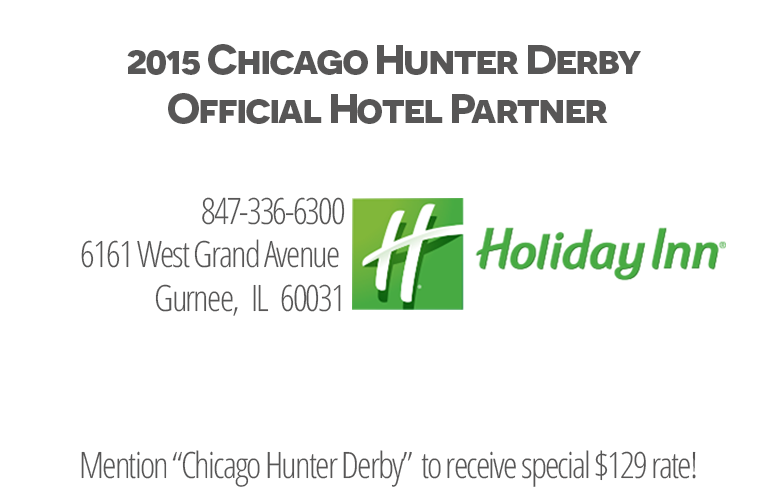 Glory Days Farm and Gene and Georgetti sponsored the USHJA National Hunter Derby. A perpetual trophy was donated by Sapphire Riding Academy in Mettawa, IL and Mimi Rothman with trainer Doug Boyd presented. Ashley Vogel, Mequon, WI, rides with trainer Cookie Beck and won the Leading Junior Award and Alliy Moyer, Carmel, IN, won the Leading Amateur Award, both sponsored by Sapphire Riding Academy. Moyer rides with Provost at Meadow View Farm. Alliy Moyer won the Leading Amateur Rider Award sponsored by Sapphire Riding Academy. Provost came out winning from the get go, earning the top honors in the $2,500 National Welcome Stake class on Friday, sponsored by Sea Change Farm, with an 88 on Essential. As if that weren’t enough, Provost and Alliy Moyer’s Valiant, took second with an 87. Margo Lyon’s Kadence Darco with Caitlyn Shiels aboard, landed in third place with an 84. Mindful and Kelley Farmer won the $7,500 International Welcome Stake and are leading after round 1 of the $50,000 USHJA International Hunter Derby presented by CP. Friday’s $7,500 International Welcome Stake class, sponsored by Sea Change Farm, got riders and horses out on the field to get the lay of the land. Coming out in top form right off the bat was Kelley Farmer and Kensel, LLC’s Mindful, winning the class with a score of 88. Carl Weeden and Piper Benjamin’s Corvine took second with an 86 and Farmer took third with Dalliance, owned by Avatar Real Estate. Kelley Farmer leads round 1 of the $50,000 USHJA International Hunter Derby with Mindful and Taken. 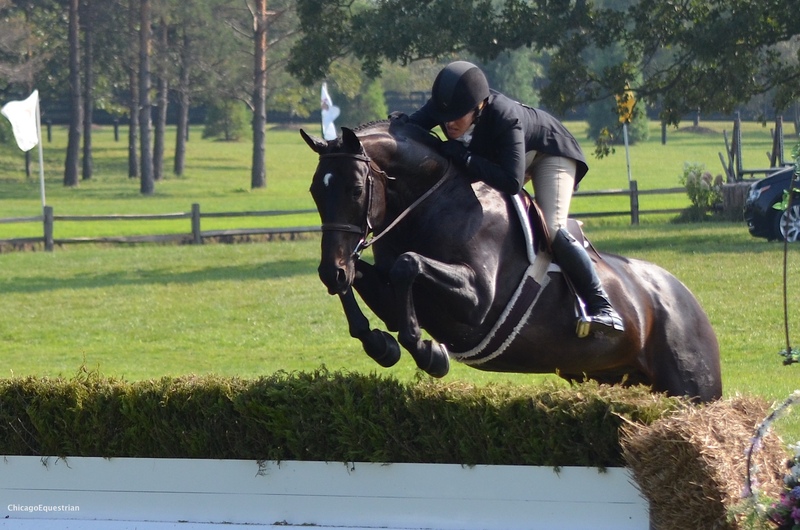 Twenty horses took on the challenge in the field this afternoon for the first round of the $50,000 USHJA International Hunter Derby presented by Canadian Pacific. Leading after todays round were two of Kelley Farmer’s rides. Mindful, earned a 195 for the top spot and Jessica Stitt’s Taken scored 190 for second. Caroline Weeden with Corvine, rounded out the top three with a 177.5. When Farmer was asked what her game plan was for round two on Sunday, she simply replied, "Don't change a thing." 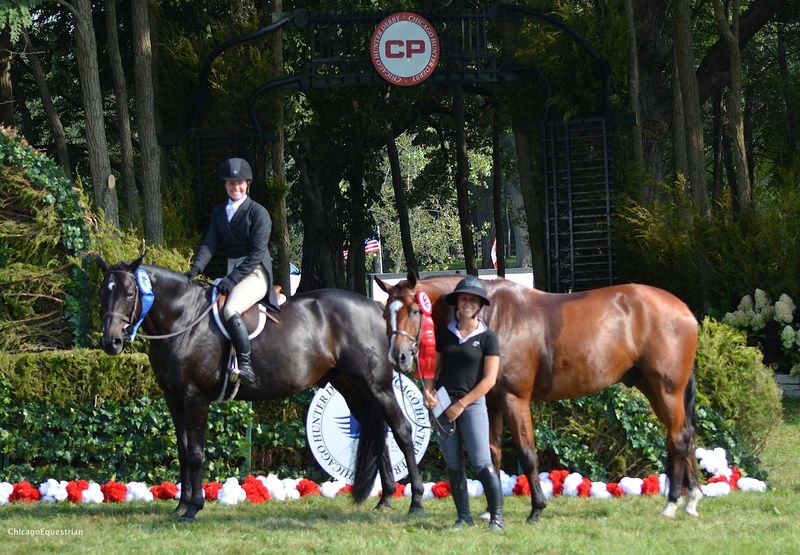 Caroline Weeden and Corvine with Margaret Benjamin accepted their award for third in the first round of the USHJA International Hunter Derby and also placed second in the International Welcome Stake. Sunday features the final handy round plus a champagne brunch for VIP ticket holders. The farm is a gorgeous setting for the event, with the pond and fountain in plain view from the spectacular VIP tent. High-end shops will display fantastic items for purchase and children’s events are sponsored by the Novy and Vogel families. The CP Puffer Belly Express train will be giving rides and the petting zoo and horseless horse show will keep kids busy for hours. Adults can shop horsepower of a different kind with Lake Forest Sports Cars offering Ferrari test drives and Land Rover Lake Bluff has vehicles on site to check out the latest models. If you can’t make it in person, EQSports.net will be taping the event to air on Monday evening. For more information, please visit the website at www.Chicagoequestriansforacause.com. Canadian Pacific: Canadian Pacific (TSX:CP)(NYSE:CP) is a transcontinental railway in Canada and the United States with direct links to eight major ports, including Vancouver and Montreal, providing North American customers a competitive rail service with access to key markets in every corner of the globe. CP is growing with its customers, offering a suite of freight transportation services, logistics solutions and supply chain expertise. Visit www.cpr.ca to see the rail advantages of CP.